Fun was had by all on October 14 when Mount Tabor’s Historical Society held a special tour for members of the Woman’s Club of Parsippany- Troy Hills, prospective club members and friends of the club. Historical Society member and longtime Mount Tabor resident Beth Shaw led the tour which started at the Bethel Pavilion and weaved through the colorful period painted gingerbread Victorian homes. After the fascinating tour, the Woman’s Club made a donation to the Mount Tabor Historical Society. The Mount Tabor History House Museum is open to the public on the 2nd Sunday of each month and by appointment. Their upcoming Holiday Craft Fair is Saturday, November 11 from 9:00 am to 4:00 pm and Sunday, November 12, from noon to 3:00 pm. Proceeds go to maintaining the Mount Tabor History House Museum and for educational programs offered to the public. For more information call 973-975-0001. The Woman’s Club of Parsippany Troy-Hills holds their next meeting on Monday, October 23. In November, their meeting is on Monday, November 27. Meetings start at 7:00 pm at the Lake Parsippany Rescue & Recovery Building, 100 Centerton Dr., Parsippany The club is always looking for new members eager to take part in community activities and help those in need. The Woman’s Club of Parsippany-Troy Hills is a member of the New Jersey State Federation of Women’s Clubs of GFWC (NJSFWC), which is the largest volunteer women’s service organization in the state, providing opportunities for education, leadership training, and community service. For more information call Cathy at 973-984-0758, e-mail the club at womansclubofpth@gmail.com, check us out on the web www.parsippanywomansclub.org or on the club’s FaceBook page. 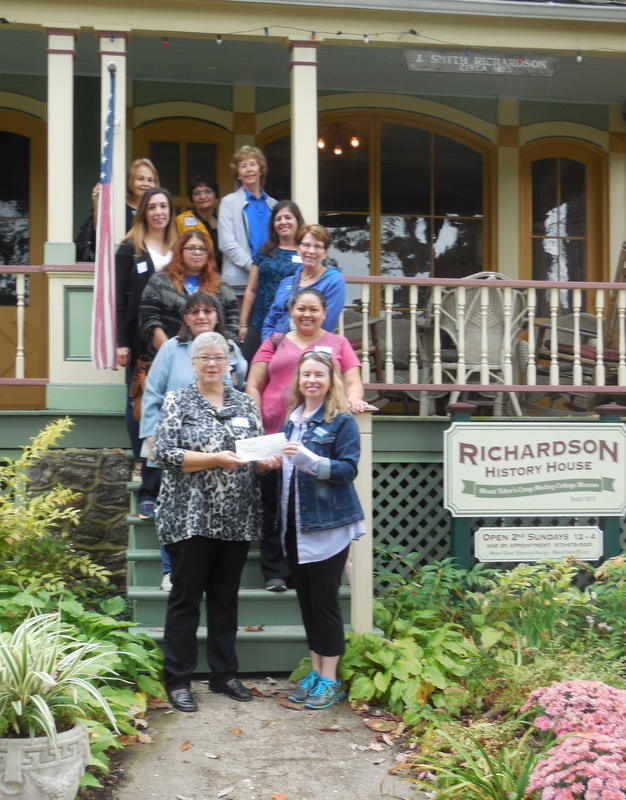 In front on left – Mount Tabor Historical Society ember Beyh Shaw accepts a donation fro m Woman’s Club of Parsippany-Troy Hills 2nd Vice President Cathy Cerbo while the tour group looks on.